Braeburn is one of the most important commercial apple varieties. It originated in New Zealand in the 1950s, and by the last decades of the 20th century had been planted in all the major warm apple-growing regions of the world. Braeburn accounts for 40% of the entire apple production of New Zealand. Even in conservative Washington state, the most important apple-producing area of the USA, where Red Delicious and Golden Delicious have always held sway, Braeburn is now in the top 5 varieties produced. The reasons for this success are not difficult to pinpoint. Braeburn has all the necessary criteria for large-scale production: it is fairly easy to grow, produces heavily and early in the life of the tree, it stores well, and withstands the handling demands of international supply chains. What marks it out from the competition is flavour. Braeburn was the first modern apple variety in large-scale production where the flavour was genuinely on a par with the older classic apple varieties. Braeburn's depth of flavour makes its main competition - Red Delicious and Golden Delicious - seem one-dimensional in comparison. At a time when consumers were starting to look for something less bland in their weekly shopping, Braeburn was the right apple at the right time. The commercial success of Braeburn has opened the way for the development of many new apple varieties where flavour is now one of the main selection criteria. 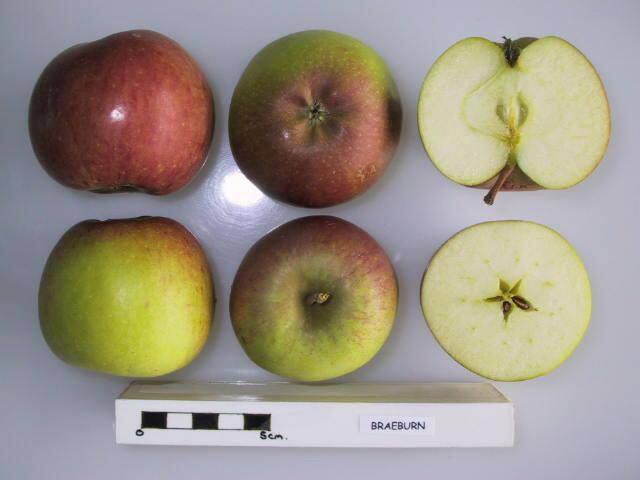 Braeburn was one of the first "bi-coloured" varieties, a characteristic now regarded as essential for sales success. In comparison the first wave of supermarket apple varieties were either bright red (Red Delicious) or shades of solid green (Golden Delicious and Granny Smith). This combination of modern colouring and flavour means that Braeburn was effectively the first of the new-wave of modern apple varieties. The first Braeburn tree was discovered growing in New Zealand in the 1950s, and is named after Braeburn Orchards, where it was first grown commercially. It is generally thought to be a seedling of a variety called Lady Hamilton. The other parent is not known, but is popularly believed to be Granny Smith - quite possible given the time and location of its discovery, but there seems to be no scientific evidence to confirm this theory. When conditions are right there is no doubt that Braeburn is a first-class dessert apple. It easily outstrips its late 20th century peer group (Golden Delicious, Granny Smith, Red Delicious) with a richness and complexity of flavour that they cannot match. In fact in many ways Braeburn is now the benchmark apple variety against which all other commercial varieties should be ranked. It is crisp, without being hard, and very juicy. It snaps cleanly to the bite, and there is an immediate rush of strong apple flavours. The overall flavour is sharp and refreshing but with a good balance of sweetness - and never sugary. There is occasionally a hint of pear-drops to the flavour of a new-season Braeburn (a characteristic which is more prominent in its offspring Jazz). Braeburn is at its best when cooled slightly below room temperature, and if you get a good one it really reminds you why you like eating apples. If there is a downside to Braeburn, it is probably poor quality control. Braeburn is grown throughout the warm apple-growing regions of the world, and it also keeps well in storage. As a result there can be quite a variation in quality and flavour of Braeburn apples reaching the consumer from different countries and at different times of the year. Since Braeburn is too old to be trade-marked, there is little control over the "brand" - quite a contrast with the rigourously-controlled production of Pink Lady for example. Of the southern hemisphere producers, we think Braeburns from Chile are often good - at their best in June. Braeburn is also widely grown in Europe, and France seems to have the best climate for producing good ones - try them in November. A number of sports of the original Braeburn have been developed, including: Hidala, Mahana Red, Royal Braeburn, Hillwell, and Southern Rose. Braeburn's other weakness is that whilst it is not difficult to grow, it is difficult to grow in an organic regime - although this is also true of most of its competitors. Apple varieties which have been developed for disease resistance and therefore more amenable to organic production such as Topaz - in many ways quite similar to Braeburn - have not achieved the same commercial success. Braeburn stores very well, and apples for cold store are generally picked whilst still slightly immature. Whilst some apples improve in store, Braeburn is arguably at its best soon after picking. Some growers and supermarkets offer premium tree-ripened Braeburns from time to time and these are worth trying. They are likely to have more red and less green colouring than conventionally stored apples. Braeburn is grown commercially in the southern UK, but it really needs a warmer climate and longer growing-season than is usually possible here. According to UK government DEFRA statistics, in July 1994 there were about 194 hectares of Braeburn orchards in the UK - compared with 669 hectares for Gala and more than 3,000 hectares for Cox. Even early varieties with little shelf-life such as Discovery (300 hectares) and Worcester Pearmain (213 hectares) are grown more extensively than Braeburn. Whilst UK supermarkets are under some pressure to source apples from within the UK, it is perhaps questionable whether growing varieties like Braeburn, which are not really suited to the UK climate, is the best solution. However, to partly contradict this view, another view is that the marginal UK climate can actually produce better flavour in an apple compared to ones grown in more temperate European climates (notably France or Italy). On balance we think the main problem with UK-grown Braeburn is not so much the lack of sunlight, but the shorter growing season. Braeburn is a relatively easy variety for the backyard orchardist. It likes a warm but not hot climate. It can be grown successfully in the southern UK, and most parts of the USA. In the 21st century Braeburn faces competition as supermarkets start to offer a much wider choice of apple varieties - not least from one of its own offspring, Jazz (a cross between Braeburn with pollen from Gala). Compared to the last decades of the 20th century when just a few apple varieties dominated world production, the market is now much more diverse. However when properly grown and marketed Braeburn is such a good apple variety that it is likely to remain one of the leading varieties for many years to come. Very good. Crisp and juicy. I just taste-tested a Braeburn against a Pink Lady. First, Pink Lady is a solidly good apple, but not my favorite. I use it as a benchmark because it’s reliable, good in all categories I test, and available most of the time in my area. Second, I taste each apple plain/raw, plain/cooked, raw with cinnamon, and cooked with salt and brown sugar. These are just my personal ways of eating apples, so goodness in these categories works for me. Third, I like fruit to have a characteristic scent. An apple should smell like an apple! Okay, so Braeburn: Fresh and raw, it is nice. Has a nice, yielding crunch, and is sweet. I would call it subacid. Cooked, it is disappointing. It has an odd smell, and tastes kind of like a cactus. It retains its sweetness, but loses all subtlety. The raw form is decent with cinnamon, but kind of not strong enough to balance cinnamon’s intensity out. Cooking with salt and sugar did not improve it much, and that is a difficult achievement. I would not waste space in my garden for this one when I could grow Honeycrisps and Newton Pippins. Braeburn is an absolute winner in my book and the organic ones provided by my East End Food Co-op this year were (and are) spectacular. For enjoyable eating they are hard to beat: fine texture, thin skin, wonderful sweet/tart flavor with some sort of aromatic nuance that is enchanting. One of a very small list of apples that approach perfection for me. Good flavor, crispy, sweet and tart, doesn't brown fast. Can't go wrong with Braeburns when Honeycrisps get too expensive during the winter months. They're cheap, but that shouldn't scare away apple lovers. The vast majority of Braeburns I've had retain their crisp and juicy crunch. They're still better than a lot of the newer "designer" cultivars, like the Envy, and a heckuva lot cheaper. I first discovered Breaburn apples about 20 years ago at Cub Foods. At that time all of this variety were from New Zealand and quite good. Three or four years ago I bought some that were grown here in the USA and they were not as good. So now if I was a Braeburn I look for the New Zealand stickers. Just way too hit or miss for my tastes. I've had great ones, but I've always had many, many horrible ones that I couldn't come close to finishing. Give me the reliable excellence of a Honey Crisp any day of the week. I am a Braeburn apple fanatic and reading this page was like finding a gold mine. I'm from the Pacific northwest and while all my friends are ranting and raving about Honeycrisp apples, I continue to defend why Braeburns are superior. Seriously, people don't try tons of varieties here, they just dash for the apples with the most appealing name. Alasdair, you won't be able to grow a true apple from seed. All apples are grafted onto a rootstock. You will be very dissapointed if you are hoping to grow an apple from a pip! Naimh, I have just bought a Braeburn in the LIDL shop, they have lots of fruit trees for £10a at this time of year, but you have to be quick, they sell out fast! Very sweet and juicy. Delicious! I was thrilled to see this variety at my local grocers this season. However, the first Braeburn I bought was rotten when I cut into it - with no outside hints to that fact. I was disappointed, but picked up another one on my next trip. At the store, I noticed there were green/yellow/red Braeburns and also dominantly dark red ones. I tried to do a quick search on my phone to see which I should get. I ended up picking out a dark red one as I tend to favor red apples. I was so disappointed in this apple! I had high expectations since it's in the top ten varieties on this site - which I love. It turned out to be too hard, bland, and somewhat chalky (?). Not a pleasant apple at all! I almost threw it out, but didn't want to waste nutrition. I will not be eating one of these again. My least favorite apple. My favorite apples are MacIntosh and Honeycrisp, so if those aren't to your liking, maybe you will like this apple. I only buy Braeburn apples imported from New Zealand. After several years of trying, it is obvious the apple growers in the United States just can't do it right. I have just planted braeburn seeds before reading the information on the page. Unfortunately, I live on the Isle Of Islay where there's more rain than sunshine. What do I do? The Braeburn is available here in New Zealand all year round due to the fact that it is held in Atmosphere Controlled conditions. Most people will know that it is one of the top supermarket brands due to the fact that it looks good and has a tough skin that does not damage easily besides being crisp and juicy. The effect that the storage has on the Braeburn is that the core of the apple often goes brown but surprisingly they still stay crisp and juicy. With regards to eating it out of season I only eat the outer most surface before getting to the discoloured section before binning it. Still not bad eating in the middle of winter. Looking forward of course to picking mine however fresh from the tree. How come I can never find UK grown Braeburns in Ireland? Throughout this winter I could buy from my local Asda supermarket ripe Braeburns from France weighing 16ounces each with stunning complex flavours. Any Jap would be proud to give them as a present. Now they are stocking unripe refrigerated Braeburns half the size from New Zealand which taste like mud. Sundowner from Australia is even better than Braeburn. A new variety - sweet and crisp. Just the best and I have substituted it for my old favourite - the Braeburn. WHAT AN APPLE, LOVED IT SO MUCH I PLANTED MY OWN TREE 6 YEARS AGO JUST INCASE ASDA STOP SELLING THEM. Im in the process of making 2kgs of Braeburns into 2 gallons of Braeburn Apple wine...yum! To Tina in Perth, They are in Coles on the East Coast at the moment. I started eating them in Canada in the 1990's and no other apples has passed my lips since then. I was introduced to the Braeburn about 2 years ago when I was quite ill, and craving apples. I have not eaten thing else since (apple-wise!). Truly the best apple ever! The only down side is that they are so popular, I can not find them right now! 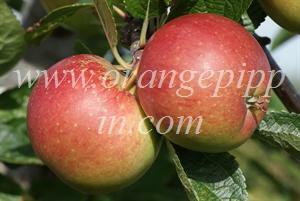 braeburn is my favourite new tree this year, five large apples now late july, cant wait to try them. my very own apples. I always bought Galas until I tasted Braeburn I do not think I will buy them anymore. My favorite now,is a Braeburn.I just love them they are so firm and crispy.It is a great diet snack apple just having one and a tall glass of skim milk satisfies you until the next meal.And if you are hungary before bed a nice warm glass of skim milk and a Braeburn is better for the stomach than a heavy snack and you feel relaxed and sleep better. This has got to be the BEST apple I have ever put in my mouth!!!!! I don't even like apples, and I am eating 1 - 2 of these a day! Love Them, Love Them, Love Them! I have a six year old tree in the back garden,well sheltered. Superb crop in 2007. Best apple of the lot. Suffers from a heavy June drop but harvested well over 20 kilos of mature apples. Since trying a Honeycrisp apple I have been unable to enjoy almost any other apple. I just ate a Braeburn and although the flavor was nice, the texture was very pasty, what other apples can give me the crunch and crispy tartness of the Honeycrisp? I love braeburn apples but I cant get them so far here in Cyprus, do you know of a local source or importer? Anyone know if Braeburns are available Western Australia? I, too, am eating a Braeburn apple as I read this information. We bought some from a local orchard and I've discovered I like them lots. Seldom do I crave an apple, but this one I do. I didn't even want to mess it up with our homemade caramel dip. I have a Braeburn in my home orchard that is just coming into production. I understand that they are iffy in my climate zone because they need a longer season to mature fully. It is now November 4, and the Braeburns that are still on the tree seem small and slightly underripe. They are edible, but only of fair quality, and their skin is a litlle on the tough side. On the whole this summer has been ideal for apples, and my Spigolds were as big as grapefruits. My red delicious were large, beautiful and tasteless, so I cut down the tree to make room for another variety. I have been thinking of Sonya, but they may be more suitable for the northwest. Any thoughts of Sonya in chilly upstate NY? James Weblemoe, one of St. Joseph's residents told me to his pick all the apples from a tree in a house he was selling. I think it is a Braeburn apple. The tree was in the yard when he bought the house 35 years ago. Ojai has some frost. Generally, it has hot inland valley climate. Your information about the lack of quality control was very helpful. I've been wondering for a long time why I haven't been able to find the same great taste that I had come to love. Now I only buy if I can try first. What sources would you recommend to grocers. This is the best apple out there. I have been eating them for quite sometime. I won't eat anything else. If there aren't any braeburn apples I won't buy any other kind. The description is right on sweet-tart and hard and crisp are all perfect to describe this apple. YUMMY!!!!!!!!! I too have recently discovered the Braeburn apples. And they are absolutely delicous. The ones that I purchased came from Chile. Wonderful crisp flavor. They now top my list of favorite eating apples. I just tasted my first Braeburn a couple weeks ago. I have been buying them ever since and eating one daily. They have replaced my favorite Granny Smith. They are so delicious! I wish I could grow them myself. I'm eating two Braeburn apples a day and just love them! They are so juicy and tasty, when I bite in one the juice hits my palate. I wonder if I could use them in an apple pie, must try sometime! Braeburn apple is a new discovery for me and is very comparable with the Macoun when at their best. My favorite!!! Absolutely agree! I was eating a Braburn apple while reading your very informative article. I have been an avid fan of the Granny Smith apple but ran into this apple and could definitely taste the granny smith and pear type flavour that you referred to. It is definitely the best apple I have had in a while. This apple is very versitile--eating it and/or baking with it would provide the best results for any chef! Thanks for the info! The hard to come by sweet juicy Washington Apple has been replaced by the Braeburn Apple in my shopping cart. Sweet, the right amount of tart, crispness - but unfortunately bruised or old most of the time. Once I find a good batch, I over indulge. yum.